By the end of my first year of residency, I knew I was in trouble. I was overwhelmed by the 15-hour days, the unbearable sadness of the tragedies I witnessed, my feelings of impotence and my fears of making a mistake. My life was my work and everything else seemed to be falling apart: my physical health, my relationships, my ability to sleep after months of night shifts. Yet, I came to work every day. I completed every task. And then I'd go home each night and cry. An administrator pulled me aside one morning: “How’s it going?” she asked. I began to sob. “Well, get yourself together and get ready for the day,” she said. I dried my tears off in the bathroom and readied for the rest of my 12-hour shift. I thought I was alone. I wasn’t. After interviewing several residents at Boston teaching hospitals (their names are changed or omitted to protect their privacy) and reviewing the research, I'm starting to understand the scale of mental health disorders in residency and why this problem seems to be growing worse. Residency’s long hours, trauma, sleeplessness and social isolation inevitably erode our healthy coping mechanisms. At the same time, there is a powerful culture of fear, stigma and lack of self-care that prevents residents from seeking help. The resources that are in place in residency programs are simply not adequate. Depression and other mental health disorders are incredibly common in residency. In a review article, Dr. Douglas Mata, an intern at Brigham and Women’s Hospital, and his colleagues concluded that the prevalence of depression was around 29 percent. In other words, at any point in time, nearly one in three physicians in training is clinically depressed. During the first year of residency — commonly referred to as “intern year” — depression rates increase by about 15 to 30 percent, the biggest jump in medical training. After that first year, depression rates decrease, but they never return to the level they were before training started. By the end of residency, depression rates are “still double what they were prior to starting your intern year,” Mata said in an interview. While we may not know why exactly this happens, Mata ticked off reasons that resonated with me: We have little control over where we end up when applying for residency programs, and we may move across the country and lose our social support system. Then we have to work 80 hours a week and have no time to develop a new one. “You might miss weddings, funerals. There’s just no time for you to be a regular person,” Mata said. A month after I began residency, my uncle called me. He had been losing weight. He was in pain. “I think I have pancreatic cancer,” he said. Though his doctors were doing tests, he wanted my opinion. I tried to reassure him. I left for my first vacation and tried to forget the intense stress of my first two months, and the nagging feeling that my uncle might be right about his diagnosis. Upon my return, I had two messages from my uncle. He had had an endoscopy and a blood test. As he went through the results, I looked up what they meant. Slowly, dread washed over me. He was diagnosed with pancreatic cancer. Three months later he was dead. Meanwhile, in the hospital, I was surrounded by deaths that I had to manage. I hadn’t processed my uncle’s death. I worked in the intensive care unit during his funeral, walking a patient’s family through the death of their loved one while my family was grieving in Texas. These deaths took a toll on me. The first time a patient I took care of in medical school died, I wanted to stop and talk about it. “We have to keep going,” my attending said. “There are a lot of other patients.” I looked up to him and hoped he was right, and that I could just pretend these terrible things hadn’t happened. Connecting with patients made the work feel worthwhile but brought its own heartache. As residents, we are the pressure point of a broken system. We have to tell patients they need things they can’t afford, and in Massachusetts, we live the difference between universal access to health care and equality of access. Every week, I had a patient who couldn’t get the care that they needed, because they had no support, they didn’t have the right type of insurance, or their life was simply too chaotic and the medical system too bureaucratic to respond. The lack of face time with patients strains the relationships that make medicine fulfilling. In 2013, a study in the Journal of General Internal Medicine found that residents spent less than eight minutes with each patient. Many older physicians blame the duty-hours restrictions — which prevent residents from working more than an average of 80 hours a week — for this. And though the hours of duty have been restricted, the amount of work has increased. “Overnight, you might be responsible for 40 to 80 patients,” Mata said, all of whom have complex reasons for being in the hospital and ever shorter stays. To get through the days and nights, the things that disappear are not the forms we have to fill out, but the time chatting with patients, connecting to them on a human level, eating lunch with colleagues, processing our grief and helping others process theirs. But we cannot pause the world around us. Things go wrong. One resident I spoke with learned that the hard way in her second year of training. She'd always taken care of herself with regular exercise and therapy when things were overwhelming. She excelled in school and training. She dreamed of being a leader. Her first year went well. Then, at the beginning of her second year, when she was now responsible for supervising other physicians for the first time, her boyfriend’s mother died suddenly. She was overwhelmed with the loss and the long days. She forgot to check the labs on one of her patients. "I got a page ... that my patient was admitted to the ICU and all the terrible things that had happened, and I was completely mortified. I mean, I was devastated. It was a patient I was very close to, who I saw a lot, and who was not doing well and we all knew that, but I shouldn’t have let it slip, you know? And I just didn’t realize ... that the days had passed and I hadn’t looked at those labs. And that was terrible." The patient survived. But the resident knew she needed help and didn’t know where to get it, so she went directly to her program director. “I had to go through this in a very public way, and I worry how it will affect my opportunities to be a leader in the program,” she said. 1. I haven’t had depression, just depressive symptoms — for weeks. 2. I have experienced depression/suicidal thoughts/substance abuse, but I don’t want to talk about it, even anonymously. 3. I am not doing well right now. Can you help me find a therapist? In these responses, I felt denial, secrecy, stigma and hopelessness. Sarah, the intern I spoke with, agreed. Though she would have no qualms about seeing a therapist, she didn’t know quite how to do it. Going to therapy would mean leaving work at a place where it's difficult to even break for lunch. “I never asked because it didn’t even seem plausible,” she said. A fellow intern who was struggling seemed very depressed and Sarah was worried he might hurt himself. She didn’t know how to help him. She found herself searching her hospital’s website but then gave up. About a month after my uncle died, I was supposed to meet a friend for brunch. She was not a doctor, and I was looking forward to hearing about the world outside of my work. She didn’t come. Later, I found out she had committed suicide the night before. I knew that this was too much for me to handle. I went to the administrator designated to be the liaison for residents in need of mental health assistance. I was hesitant to reach out to her because she had other roles in the residency program that left me concerned about my confidentiality, but I did. This administrator connected me to a therapist, whose office was below my program director’s. I found myself coming into the hospital on my day off, talking about how hard it was to always be at the hospital. After our sessions, I would scan the hallways for my employers, and dash out of the building. After three visits that made me feel even worse, I quit going. Suicide is the threat that lingers around us in training and beyond; it calls attention to mental health disorders in residency that often go ignored. At the beginning of my second year of training, two doctors jumped to their deaths in New York. These public suicides were impossible to overlook, and prompted some soul searching in our community. They reminded us that the rates of physician suicide are much higher than in the general population: twice as high for men, and four times as high for women. But these numbers come from only those deaths that are reported publicly. In reporting this story, I heard of five separate deaths that were widely known to be suicides, but never publicly acknowledged. “Their deaths are not being recorded as such,” Mata said. “Someone who overdosed on fentanyl might be listed as having died of a drug overdose.” It is possible that a physician could die of an accidental overdose, but we write drug doses for a living. This gap in data contributes to our inability to address mental health and suicide among physicians: We don’t even know how big the problem is. A third-year resident, Kate (not her real name), recounted the day that things became so bad she called a suicide hotline. The operator didn’t know what to tell her, and she got off the phone. She was alone on her birthday, overwhelmed with loneliness. She started cutting herself. A few friends came to check on her. One of them called her program director. The program director called an ambulance and sent her to a nearby hospital (luckily directing the paramedics to bypass the hospital where Kate worked). She was now a patient, strapped down in the emergency department. “That changes my status. I will always be that person,” she said. After being released from the hospital, she took time off to get better. Later, when she applied for her medical license, Kate had to explain the gap in her training to the Massachusetts medical board. The license application requires applicants to report if they have taken any time off from the beginning of medical school through training for any reason. Kate says she had to go in front of the whole medical board, and was asked in-depth questions about her depression and suicidal thoughts. “I walk into this room that was set up like a courtroom,” Kate recalled. “I felt like I was being vilified,” she said. Dr. Candace Sloane, chair of the Mass. Board of Registration in Medicine, said she recognizes the challenge of getting physicians to admit they might need help. "Even in medical training, we’re taught we have to almost be superhuman," she said. "People who want to pick medicine tend to be the kind of people who want to be there for others. They want to be the caregiver." I agree that denial keeps many of us from reaching out until things are already out of control. But even when we want to reach out, we often don't know how. At the end of my intern year, a psychiatrist I worked with in my clinic said she had noticed that I seemed to be struggling. I told her that I'd tried to find help, but that seeing someone in the hospital building where my boss worked was untenable. She asked around and found a list of outside therapists and psychiatrists who would see residents with my insurance. I started cold-calling dozens of providers until I found one. My new chief resident made time for me to go, treating me with compassion and privacy. After about a month, I began to feel like I was going to recover. I began to enjoy life outside of work again. I prioritized my health while still doing my work. Most importantly, I shared my experience with some friends in my program and they shared their own stories. I finally understood that this was not just about me. I wanted to put this experience behind me. In the summer after intern year, I was visiting a friend in New York. On the way back to her dorm building we heard someone had jumped from the roof, one of the two interns who would take their lives that week. Shortly afterwards, our program had a meeting about those suicides. The directors told the residents that there were plenty of resources in place. It was easy to get help, they said. It was one of the scariest moments of my life, and one of my proudest. In the years since, I have helped dozens of friends get help. My residency program, in turn, did a lot of great work to establish a physician health committee. The committee is led by two psychiatrists who are not involved in the residency program, and who assist residents in getting access to care within and outside of our hospital system. Mata, like me, was inspired to continue to work on this issue because of his friends' experience — and his own. He initially started a residency program in urology at Massachusetts General Hospital, and realized he had chosen the wrong field. Because of his interest in mental health disorders for trainees, he felt empowered to get help early. At a moment when he felt particularly low, he called the employee assistance program: "I think I’m having a major depressive episode, what do I do?" he recalls asking. "And they said, ‘No problem, we get that a lot.’ ” He switched to pathology and after a few counseling sessions, felt healthy again. In writing this piece, I've come to realize that we continue to treat mental health disorders in medical training and practice as the exception. But in reality, mental health disorders in residency are the rule, and those who never experience them are the exception. And though it is common, it should not be dismissed as “normal.” We should not tell trainees, as I was told by numerous colleagues and my own providers, that “this is just residency.” I had clinical depression, and it was very treatable once I was able to get adequate care. • We should have regular debriefing sessions in a safe space for residents to speak about issues that they face, such as the one at Stanford's surgery program. These sessions should be mandatory, and could be group sessions or one-on-one meetings with mental health professionals. The sessions should not include anyone with an administrative role in the residency program. Otherwise residents can feel pressured to not share their failures, compounding the issues they already face. • We should train residents to recognize mental health disorders in each other (something we are shockingly bad at) and empower them to help colleagues who are suffering. • There should be mental health liaisons who are fire-walled from the residency program and can help connect residents to therapists. These liaisons need to be regularly visible to residents, not just at orientation, or it is unlikely residents will know and trust them. • We should collect statistics about all deaths at medical schools and residencies to get a better idea of how many physicians are actually committing suicide and what can be done to prevent it. • To protect the confidentiality of residents seeking mental health care and to eliminate the issue of time, we should make it mandatory for residents to leave the hospital during working hours once a week. Those who need therapy will then be able to access it confidentially, and those who do not can use this time for self-care to try to prevent mental health disorders. • Residents who are comfortable sharing their experiences can do a lot for their fellow physicians by being open about their struggles. Programs should encourage residents to share and listen and respond to residents’ concerns about supports that are in place. • Also, I would implore previous generations of physicians to recognize that medicine is not the same as when they practiced, and the hours restrictions in and of themselves do not mean that we are getting less exposure to patients and teaching. Rather, it is the quality of those hours that is the problem. The top-down nature of the reforms led to excessive night shifts and overnight calls that are less about our education and patient care and more about filling staff quotas. • Finally, the licensing process stigmatizes physicians who take time off. We need to protect the public from physicians who are unsafe to practice, but I would submit that physicians who proactively take time off when they know that they need extra support should not be stigmatized for doing so. License applications in our state and other states should clearly distinguish between physicians who asked for time off and physicians who were removed from work. There should also be much more transparency in the licensing process. The perception that having a mental health disorder will prevent a physician from obtaining a license prevents many from seeking care until it is too late. All of us will be patients at some point in our lives, as will our loved ones. Supporting physicians to be healthy will make it possible for them to be there physically and emotionally for us when we need them most. The irony of my experience is that I was worried that I would be perceived as less of a physician if others knew that I had had a mental health disorder. In reality, my experience with depression made me a much more compassionate physician and colleague. The system has been far too slow to respond to this crisis. I worry about my colleagues who still do not feel safe or supported, and the many good reasons why they feel this way. For those who are still struggling, please know, you are not alone. If you are a doctor who thinks you might need help and are currently working at any Massachusetts medical facility, you can find help at this website. If you are affiliated with Partners HealthCare, you can also call this 24-hour hotline: 1-866-724-4327. 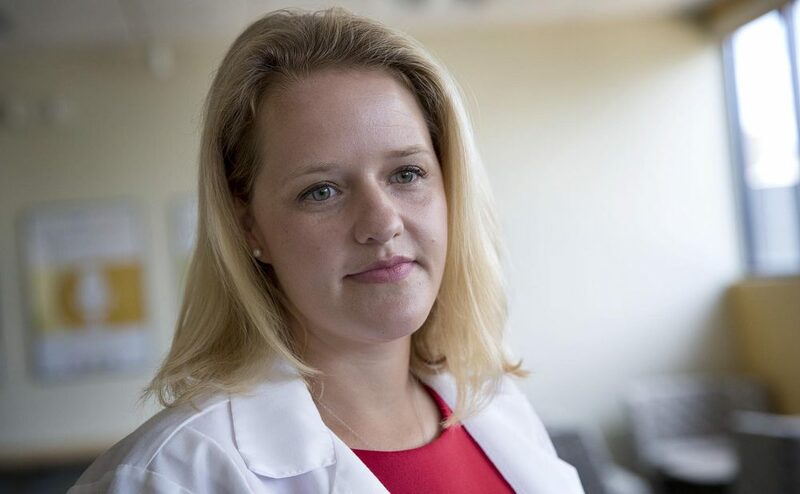 Elisabeth Poorman is a recent graduate of Cambridge Health Alliance and a primary care physician in Everett, Mass. She tweets at @DrPoorman.